SOCH Early Childhood and Preschool Program is curriculum based education and therapy program for 2 to 6 year old children, who meet criteria for developmental delays or difficulties and are experiencing challenges in overall learning and development. Each Preschool class will have 5 to 8 children with and without special needs. Child may have delay in one or more areas of development, such as learning, speaking or playing. Services are provided 5 days per week for 3 hour duration. Apart from education and therapies, activities in this program may include field trips, outdoor and water activities, community visits, fireless cookouts, gardening, experiences with nature and classroom activities. The curriculum will address the following interrelated domains of holistic development through an integrated and play based approach which focuses on development of life skills. Enrolled children are entitled to a 5 individual intervention sessions per week or 20 sessions monthlyin 3 hours ofplay group program. The therapy program includes one on one therapy sessions of Occupational Therapy, and Speech & Communication table-top sessions. 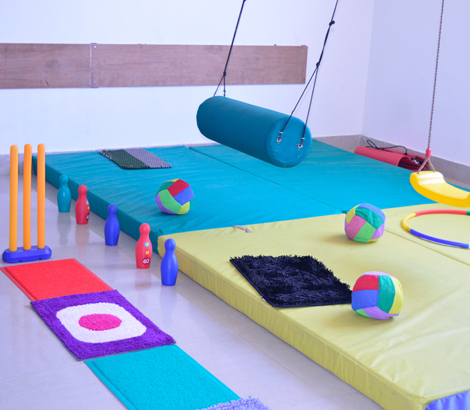 The Play Group will promote education and socialization for their life skills. A team of professionals in the field of early intervention, including Occupational Therapist, Physiotherapist, Special Educator, Psychologist and Speech Therapistwill providetherapiesand will be assigned to each class and assist the class manager and family in providing needed interventions to meet the goals in the Individualized Education and Therapy Plan.